Boston launched Pride Week Friday with a flag-raising ceremony at City Hall Plaza. 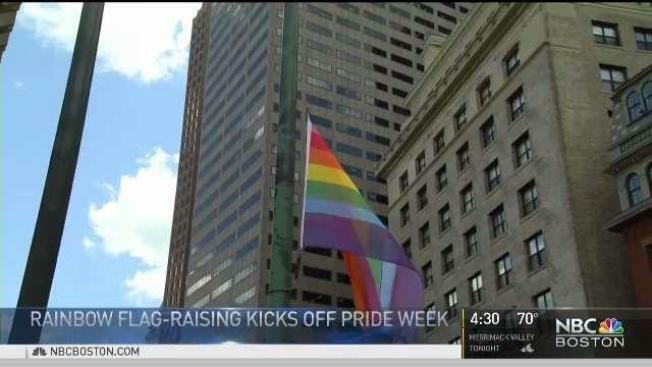 The rainbow flag was hoisted above City Hall Plaza in Boston Friday afternoon to kick off Pride Week in the city. "It’s about bringing people together in a common conviction that everyone is entitled to human rights," said Mayor Marty Walsh at the event. He joined with Boston Pride leaders to start the festivities, all under the theme "stronger together." "We here in Boston are privileged to raise our pride flag when around the globe a pride flag, a rainbow flag, is a reason to be punished, tortured, or to die," Grand Marshal Kristen Porter added. This year there was a special tribute to the creator of that flag, Gilbert Baker, who died this year, but still inspires. "My goal here is to represent transgender women of color," said a member of the pride court, which is working to carry out Baker’s legacy of inclusion. "We are out there, we are your brothers, we are your sisters, we are your aunts, your uncles. We just want your support," added another member of the court. That support has grown significantly over the years. "Families come out and support, companies come out and support," says long-time volunteer Linda DeMarco. "When I first started there were people that wanted to march but they thought they’d lose their job," she adds. DeMarco has been part of pride for two decades, and today received praise from the mayor. "As time goes on people accept, people acknowledge that equality is supposed to be across all spectrums," she said. The Boston Pride events continue each and every day through next weekend when the Pride Parade takes place. This year survivors from the Pulse Nightclub attack in Orlando will be marching with thousands of others.